SAY WHA?!?!?!?!?!?!?!?!?! Have I ever seen you not wearing that lanyard?!?!?!?!?!?! Oh yeah, you didn't where it when we were painting the town in Houston , but I certainly never saw you cross a convention threshold without it. Will they even let you in?! No, I'll be wearing my 'Make America KIND Again' lanyard (and hat) and handing out buttons. "SDCC 2018 IS IGNORING THE BABYLON 5 25TH ANNIVERSARY!!!!!" Hey maybe they'll say the 25TH Anniversary is next year because of Midnight on The Firing Line. Exactly. So I'm not going to harass them *this time* as I hope to get a panel (and that JMS will be back) next year. Be careful. That might be extremely popular. You might become rich if it is your own creation. You would likely get many orders from people wanting their own. Yes very wise decision. Give them another year then let them have it if they fail again. It almost seems that the last light of hope for B5's future is going the way of my hope for my nation. I mean, I have been struggling with the essential notion that something like 38% of the people around me think that Donald Trump is basically doing a fine job. Isn't that some kind of critical mass needed to generate society's collapse? Well it is probably a topic for another thread, but in my general vicinity it is more like 78%. I get what you mean though. As an entire nation I bet the actual figures are closer to 28 to 30%, despite what polls say. And I am being generous. Honestly there is a lot of ignorance out there as well as a lot people who just are not paying attention because they are too wrapped up in their own lives. Moving past that and back to the topic at hand. I hope Jan's travels are safe today. Good luck Jan!!!!! From what I've heard, it actually takes about 7 to 12% of the people in a country to shut it down through nonviolent protest. That's not what Trump's supporters seem to be aiming for, but they could do it if they wanted to and got organized for it. Of course, so could Trump's opponents. So far, however, nobody has been angry enough, numerous enough, or organized enough, to simply say "EVERYBODY STOP" and snarl up the country. It's also worth remembering that a very large proportion of Trump's supporters voted for him not because they thought he was competent or even likable, but because a) he's not Hillary Clinton and b) he makes liberals mad. If that was their objective and all they really wanted from him, then he is obviously doing a marvelous job on both fronts. From what I've heard, it actually takes about 7 to 12% of the people in a country to shut it down through nonviolent protest. . Someone has done their research. Yeah, I watched a TED Talk about it. When I remember the researcher's name I'll post it here. For anybody interested and attending WorldCon in San Jose Aug 16-20, I've gotten confirmation of my proposed panel. It will be Saturday 8/18 at noon. 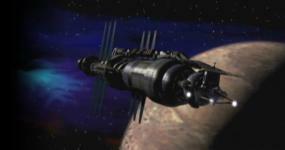 Babylon 5's pilot "The Gathering" debuted 25 years ago on March 22, 1993. With groundbreaking CGI, a five-year story arc, a budget that didn't bankrupt the studio and a show-runner who was among the first to interact with fans online, join us to relive the past 25 years and ponder what future there might be for this vast universe. I've said it before, but I'll say it again anyway - I sure wish I was going to be there.